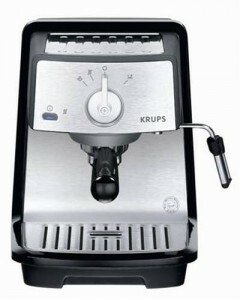 This is a nice solid espresso machine from Krups. Most espresso machines leave little room for adding the coffee grinds, so you have to brew the espresso twice to get a decent size cupful of espresso. Which means you have to empty the coffee grinds each time, while your 1st espresso and crema gets cold. This one from Krups has a bigger size container for the coffee grinds. You can make a full double espresso with creama, and steam/foam your milk and then create some cool latte art. The dial on the front is solid and easy to read. Very few moving parts, so as long as you take good care of the machine it will last very long. Recommended. Filter holder with 3 interchangeable pre-measured inserts that hold a single, double or ESE pod.